At the center of Walker and Daughter is the shop’s owner, Georgia, who is overwhelmed with juggling the store and single-handedly raising her teenage daughter. 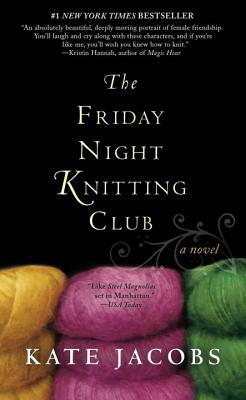 Happy to escape the demands of her life, she looks forward to her Friday Night Knitting Club, where she and her friends—Anita, Peri, Darwin, Lucie, and KC—exchange knitting tips, jokes, and their deepest secrets. But when the man who once broke Georgia’s heart suddenly shows up, demanding a role in their daughter’s life, her world is shattered. Luckily, Georgia’s friends are there for encouragement, sharing their own tales of intimacy, heartbreak, and miracle-making. And when the unthinkable happens, these women will discover that what they’ve created isn’t just a knitting club: it’s a sisterhood. Kate Jacobs is the author of the #1 New York Times bestseller The Friday Night Knitting Club, Knit Two, Knit the Season, and Comfort Food.